GAEB-Online 2018 connects Office programmes with the GAEB interface. The German abbreviation GAEB stands for “Gemeinsame Ausschuss Elektronik im Bauwesen” [Joint Committee for Electronics in the Construction Industry] (www.gaeb.de). Public and private customers, architects, engineers and the construction industry in Germany are represented at GAEB by their respective umbrella organisations. GAEB promotes the use of data processing in the German construction industry. This involves the creation and revision of standardised documents for describing construction services, the development of a service specification, and process descriptions for electronic billing of volumes and construction work. The new GAEB-Online 2018 software by the company gaeb-online in Walzbachtal enables tenders in accordance with the GAEB standard to be transferred in one click directly to Microsoft Excel for further calculations, for example. The Windows programme GAEB-Online 2018 can also be used with every other Office suite. 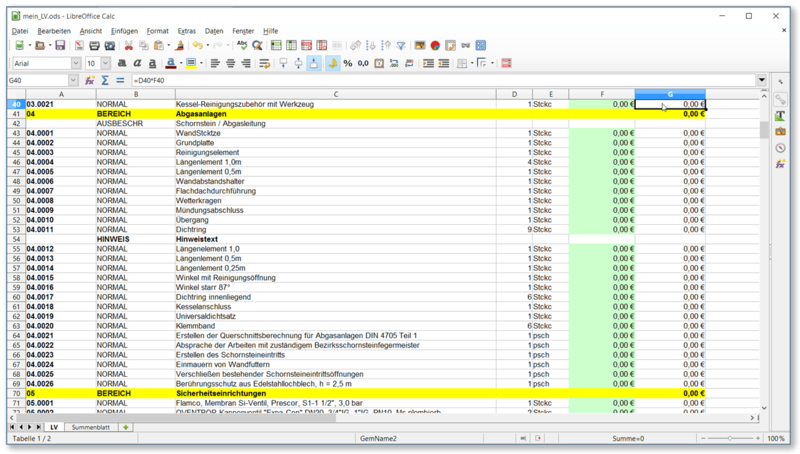 Calculations can be done in OpenOffice® or LibreOffice® and direct transfer is always possible with the new software. Users can now perform all calculations in the spread sheet to which they are accustomed without changing systems or moving outside their comfort zone. Once the calculations are completed, the unit price is transferred via GAEB-Online 2018 out of Excel to the defined tender in the existing format. Ulrike Braun of gaeb-online describes the advantages of the innovative software “Our GAEB-Online 2018 solution connects the Office world with GAEB tenders and is an excellent and favourably priced addition to every workshop”. Increasingly, throughout Germany, tenders from architects or planners are arriving in electronic format as what are called GAEB RFPs in the email inboxes of workshops rather than arriving by post as in the past. However, the offer process of the workshops can only be improved if the offer price can be transferred easily and automatically into the GAEB tender. The planners and architects naturally prefer to get the offer back as a GAEB file if possible to avoid having to re-enter the offer price to perform a price comparison. If the items consist of many individual services, as is often the case in heating and plumbing work, the calculations must be repeated or reworked which is very time consuming. "A bathtub, for example, may be a single price item in the service specifications for the planner which it wants to offer its customers; the same bathtub consists of individual items for the specialists fitting it. The requested price for a bathtub itself consists of a variety of different services such as the tub itself, frame support, taps, drain, siphon, fixtures and other accessories, all of which are taken into account as material and labour in the price calculation", Ulrike Braun of gaeb-online thus clarifies the enormous accounting expenses in the construction industry. The new software from gaeb-online means these time-consuming problems can be easily solved. GAEB-Online 2018 can be downloaded from the Internet and trialled before purchasing without obligation. The programme is compatible with operating systems from Windows XP onwards. After the trial phase, the license for the PC can be ordered. In addition, there is also a special Terminal Server Version for Microsoft Windows Server 2008 R2 or Microsoft Windows Server 2012 for team work. Comprehensive online help and a concise manual in PDF format provide assistance for optimum installation and use of the software. Ulrike Braun of gaeb-online sells software on the topic of GAEB tenders. In recent years electronic data exchange has become inseparable from the working world of skilled craftsmen. In the areas of tenders and offer preparations, the GAEB interface has become established for the exchange of service specifications and associated offers. Almost all current, commercial software solutions and tender programmes in Germany work with this interface which, among other things, permits simple data exchange between planner and workshop. GAEB-Online products are already used by more than 5,000 customers for rapid calculations with MS-Excel®, for example, and for electronic tender submissions in the GAEB DA84 format. With the introduction of GAEB-DA-XML Version 3.2, the electronic data exchange via GAEB-XML in the construction industry is steadily becoming more important for all partners involved in the construction business. To match this, a completely new generation program is available under the name GAEB-Online 2018. For all those who want to use GAEB in combination with the Microsoft Excel® spreadsheet or a free office suite such as OpenOffice® in the best and comfortable manner, GAEB-Online 2018 is the optimal solution . Based on the GAEB-Toolbox deployed by many Software manufacturers, GAEB-Online 2018 with new technology, new and modern interface and many new features now allows to process GAEB tenders faster and more comfortably and create sales proposals as GAEB DA84 electronically. Many companies mostly use a universally usable spreadsheet such as Microsoft Excel® instead of a special calculation program to calculate the tender price. This program is flexible and offers companies the opportunity to define their own rules for determining the price or access the article and price lists. And this is exactly where GAEB-Online 2018 offers decisive advantages. With just a click, the GAEB tender gets exported from GAEB-Online 2018 to Excel® for example. In case of an export, the stored calculation logic as well as formulas and totals rows also get exported to the spreadsheet. Thus, a user can quickly and easily capture the prices in the spreadsheet and all totals get calculated automatically. Or else, the user may customize the calculation logic for determining the prices as per the needs or special requirements of the project. If desired, this can also be extended from the spreadsheet generated by GAEB-Online 2018 and stored with own calculation logic, links, or premiums and discounts for individual pricing. In addition to the proven Microsoft Office®, the so-called free office packages such as OpenOffice (Apache OpenOffice®) or LibreOffice® are enjoying growing popularity among users. It is for this reason that the developers of GAEB-Online 2018 have also placed great emphasis on import and export possibility of GAEB tenders in the OpenDocument format. With GAEB-Online 2018, you can now easily export a GAEB file with a single click as an OpenDocument Spreadsheet (*.Ods). Thus, an individual offer can also be directly calculated in OpenOffice (Apache OpenOffice®) or Libre Office®. Of course all popular GAEB formats like GAEB 90, GAEB 2000, and the new GAEB XML 3.2 are supported by GAEB-Online 2018. For all price entries, the offer can directly be created again in the electronic form as GAEB D84. This saves a lot of time and besides the electronic submission of tenders in the mean time is required in the form of DA84 by most clients. GAEB-Online 2018 also allows to print offers or create .pdf files that can be if desired forwarded directly by email. The free version of GAEB-Online 2018 can be tested for 8 days. The demo version can be downloaded from the website for free. After the test phase, an activation key can be ordered online at a cost of 95.20 Euros including VAT. The program runs on Microsoft Windows XP or above. Extensive on-line help and a concise manual in .pdf format are there to help users learn the software quickly, so that it can be used immediately. You can test GAEB-Online 2018 free of charge for 8 days. Then you can easily and simply order the required registration code for use of GAEB-Online 2018 licence on one Computer with a click of your mouse.